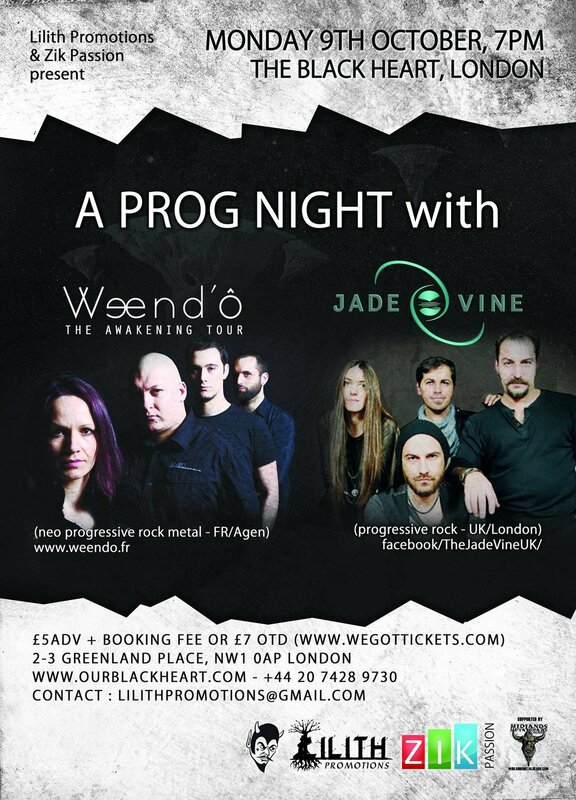 A joint effort between Lilith Promotions and WEEND'Ô bringing you a night of prog at The Black Heart in Londonl with guest Jade Vine. Tickets are £5adv + booking fee or £7otd. The musical universe of Weend'ô is a subtle mix of rock, between Pink Floyd's ambiant references and Tool's modern riffs. The harmonized and uncluttered arrangements support an original, powerful voice; emotionally charged. Weend'ô explores the depths of the human psyche: its qualities and faults, its fears and joy, its relationships... The lyrics are written from real experiences and through neo progressive rock, the audience is invited to a journey from the inside. Whether incisive or sensitive, Weend'ô «speaks» to our hearts and our souls. Their 1st album was released on January 2012 with Olivier Marot (France) and in January 2013, new versions were brought by a producer/international keyboardist Stephane De.Reine (Los Angeles). Jade Vine is a five piece, London based rock band with an alternative/prog rock twist. The band was originally formed by brothers Constantine (guitars, vocals) & Marios Magdalinos (guitars, vocals) in 2006. Constantine & Marios started writing the first songs and gigged extensively as a duet for two years in several pubs and bars around London under the name “Uncaused Creation”. In 2008, the band was joined by Babis Margaritidis (drums, percussion) and Achilles Hilmi (bass). The band gigged a lot at every possible venue of the city, building a quite respectable fan base and in 2009 recorded a demo album which would prove to be the base of their forthcoming debut album. 2012 meant to be a huge year of change for the band, reforming with the departure of Achilles Hilmi and the addition of a new member Roy Stewart on bass and changing the name to “Jade Vine” while forging a different musical direction. Catalyst of this change was the collaboration with Daniel Cavanagh from the well known band in the prog circles “Anathema”. Jade Vine teamed up with the charismatic songwriter/producer and guitarist of Anathema who took over the role of the co-producer and general supervisor of their first album.